12 January 2010 - I said goodbye to Cato today. He'd escaped the yard and gone to visit the neighbors across the street last Tuesday. He was on his way home but did not make it safely across the road. It seemed at first he would recover, but we found he had damage to the first vertebrae supporting the skull. Repair was dangerous and painful, and even if all went well the repair would be fragile so he would need to be restricted the rest of his life. For exuberant Cato the best choice was to say goodbye. Solid and stylish Open dog, regularly placing. Trial winner. Cato and I made it to the semi final round at the USBCHA nationals in 2007. He's my main farm dog as well. Cato is an easy dog to work, focused, takes commands immediately while always thinking one step ahead. He is an intense and stylish worker. He's a smart outrunner that does well on difficult fields. He holds the line well while driving. 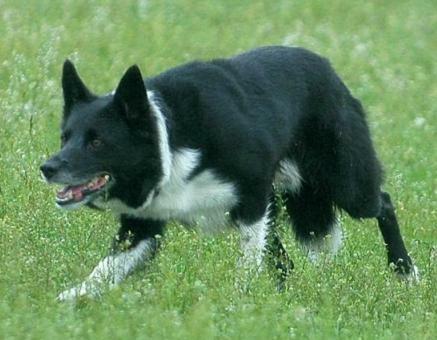 He is a strong eyed dog yet he flanks and walks onto his stock. Cato reads his stock extremely well. He's a great work dog and I'll always have him on the field while working green dogs. He'll watch quietly in the wings and be there in an instant if things go wrong. This is an easy dog to have around. He'll spend hours waiting quietly and watching at a trial, then be 150% ready to work, calm and focused, when it is his turn. He is outgoing with people and dogs, trustworthy in any environment, and actually enjoys trucks, tractors, chain saws, gun shots and other loud noises. Cato and I had the opportunity to run at the World Trial in Wales in September 2008. It was a tremendous experience. I made a couple foolish handling errors early in our run that cost a lot of points. Even without those we would not have made the semi finals. Our work for the shed, pen, single needs to improve to meet the high standards we watched at the Worlds. Agility was my main activity when I first got Cato. Before the sheepdog world lured me away from agility entirely Cato earned his ADCH, MX, and AXJ.